Thief slot machine is a suspenseful ride to big winnings. Effective graphics, a unique futuristic crime scene, and subtly building music make this a game you won’t want to miss. 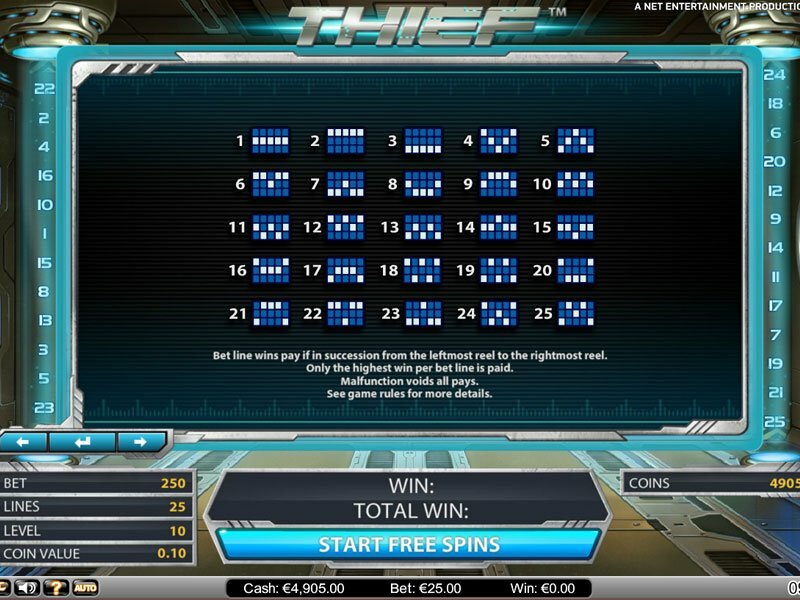 NetEnt is well known for its sleek and professional slot machine games and Thief is no exception. Welcome to the crime of the future. You’ve got touch screens, high tech watches, green lasers, and you can’t get caught! Net Entertainment has done it again with the Thief slot machine providing another game with that clean, modern, professional feel that keeps you locked in for anticipation. Thief slot machine is a traditionally shapes and designed slot with five reels and 25 pay lines. A player’s total bet can reach €125 by increasing coin value up to 50 cents (though it can also be as low as 1 cent) and by increasing the number of coins bet on each line to the maximum of 10. Set in the future, Thief slot machine takes place on a beautifully designed alleyway of some sort where the rain can be seen as it falls, causing ripples in the street puddles. 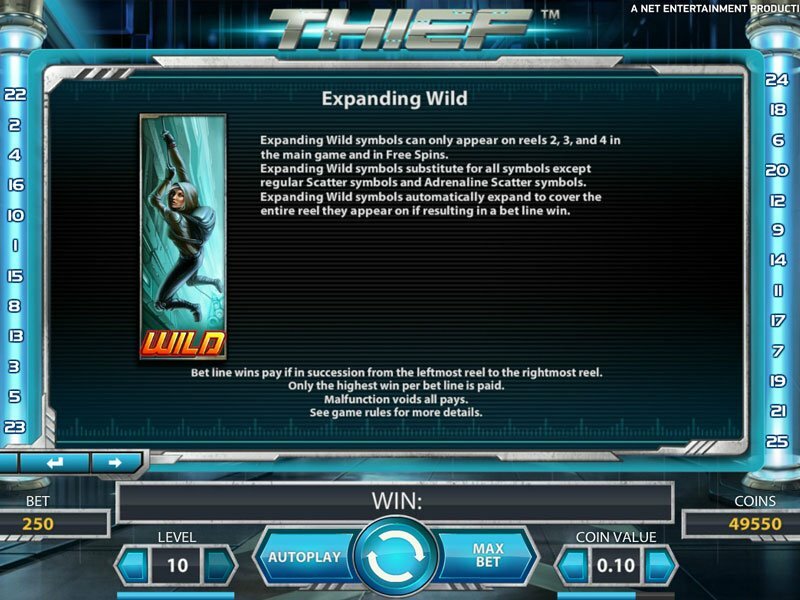 The game includes an expanding wild symbol of the high tech thief. Scatter symbols trigger free spins that can be added to while the special diamond symbol is only present during free spins, and it’s well worth the trouble you went through to steal it. High Tech thievery requires some high tech graphics and sound. Set in the future, Thief slot machine takes place on a beautifully designed alleyway of some sort where the rain can be seen as it falls, causing ripples in the street puddles. 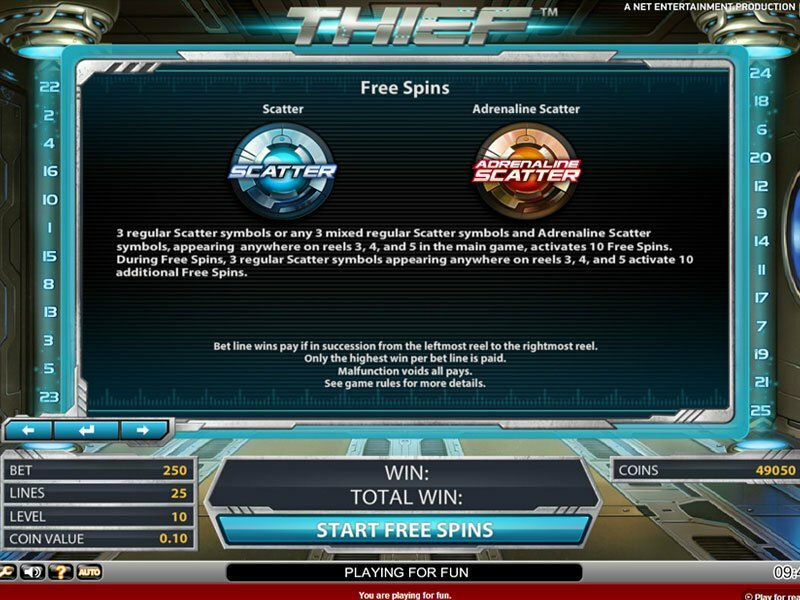 3D slot are more innovative with the level of graphic quality they produce, but NetEnt constantly releases games like Thief of high caliber for its smooth and professional attributes. Sound engineers at NetEnt do subtle, but very effective work. The violin like pads and gently expanding base line in the soft background music add so much to the game’s atmosphere that you wouldn’t realize it until you tried to play without background music at all. The soft pitter patter of the rain is easy to forget for it’s realistic subtle drip drop on the side walk and other sound effects match appropriately with the futuristic gadget theme held up so well in so many different aspects of Thief slot machine.